Africa is intensively pushing to build and grow its economy on the back of increased domestic demand, aggressive infrastructure construction activities and economic interconnection among countries in the continent. In fact, in a recent annual meeting in Rwanda, the African Development Bank (AfDB), presenting its African Economic Outlook 2014, reported that the continent’s economy was expected to grow by 4.8% in 2014 and 5.7% in 2015, approximating its growth figures pre-economic downturn. The ongoing economic efforts in the continent will, naturally, have to be supported by energy. Gone are the days of organic economies, where economic growth could be achieved through mere human and animal strength. In this day and age, almost all economies rely on power to sustain their activities and produce tangible results. Power has become an integral component of any economy or society that outages and blackouts could bring about devastating consequences. To support Africa’s ambition to achieve economic sustainability, diversity and viability, it will primarily need to boost its infrastructure to support the growth of its various industries. To achieve that, the continent will require massive amounts of power. Does it, however, have enough energy to sustain this power-intensive phase? The International Monetary Fund (IMF) sounded a warning that an escalating power supply deficiency in Africa may hamper the projected economic growth. It has been documented that some 25 countries in Sub-Saharan Africa were facing an energy crisis, evidenced by rolling blackouts, and that some 30 countries in region had suffered acute energy crises in recent years. While the Key World Energy Statistics by the International Energy Agency reported that electricity generation in Africa rose from 1.8% in 1973 to 3.1% in 2011, the continent still remained to have the smallest share globally, despite being the second most populous continent. With Africa’s population expected to double to approximately 1.9 billion people by 2050, and with the continent’s industries projected to require power at almost full capacity, the World Bank said that a much higher investment would be needed to at least double Africa’s current levels of energy access by 2030. In fact, it is estimated that the Sub-Saharan region would require more than USD 300 billion in investments to achieve total electrification by 2030. Sub-Saharan Africa was observed to have absorbed much of the blow of the recent power crisis. Blackout brought cities to a standstill and spelt terminal financial losses to small- and medium-scale companies. Mining, one of the region’s pillar industries, was severely affected, even prompting mining companies to shelve expansion plans and curtail local power usage. Nigeria, for instance, a country that has three times the population of the Republic of South Africa (South Africa), only has one-tenth of the power generation capacity of the latter, and business in the country are reportedly starting the feel the effects of power interruptions in their daily turnover. In Tanzania, a blackout that lasted for almost a month was experienced in Zanzibar when the underwater cable lines supplying power to the archipelago failed, owing to a huge surge in demand. As a result, residents needed to shell out USD 10 daily to run diesel-powered domestic generators, while businesses requiring refrigeration or heating had to suspend operations until power was restored. In Angola, the occasional recession of the water level in some of the rivers affects power production, distressing allied services, like water distribution. Luanda’s water supply firm, EPAL, cited that various areas in the city experienced water supply shortage, owing to challenges related to power distribution. The Democratic Republic of Congo (DRC), touted to be Africa’s biggest copper producer, in May 2014 advised mining companies in the country to suspend any project expansion that would require more power, amidst a power shortage that, the government said, would take years to resolve. Even the Republic of South Africa, the region’s largest economy, was not exempt from power-related woes. In a communiqué in June 2014, Eskom, supplier of 95% of the country’s electricity, warned residents of a rolling blackout due to load-shedding, which, it said, was necessary to protect the electricity grid from total blackout. Eskom said it had begun scaling down maintenance to prepare for winter, but in the face of a rising energy demand, particularly during peak hours, it appealed to the public to reduce power consumption by at least 10%. If the power demand does not decline, then, the company said, load shedding would be the last resort to avoid a total power shutdown. At present, solutions are underway – but these, naturally, will not come without a hefty price and cannot be completed within days or weeks. Economic reports indicated that, at the prevailing growth rate of the demand from industries and residents, the region would have to double its power generating capacity by 2025, at an approximate cost of USD 171 billion in South Africa alone. In order to sustain this projection, the governments in Africa have identified potential sources of funds, such as power rate hikes and foreign investment. Yet, power hikes could stir social unrest and could prompt industrial entities to cut down on operations, putting jobs and production at risk. Foreign investment agreements, on the other hand, could take time to materialize, and the planning, designing, installation and commissioning of permanent power generation projects may entail several years, if not decades. Power is indeed a fundamental element for any economy to function, as every sector of the modern society, be it domestic, commercial or industrial, is, in a way or another, dependent on electricity. Nowadays, a power interruption affecting critical facilities, like hospitals, airports, telecommunications towers, data centers, mining facilities and oil & gas installations, has the potential to put an entire country, region or city to a standstill, and in light of globalization and economic integration, the consequences could spill over regional, national or even continental borders. Hiring interim power plants to bridge the gap between the demand and the supply of electricity yields many advantages, particularly when there is a foreseeable delay in the construction of permanent power generation facilities or while waiting for the permanent power plants to be completed. 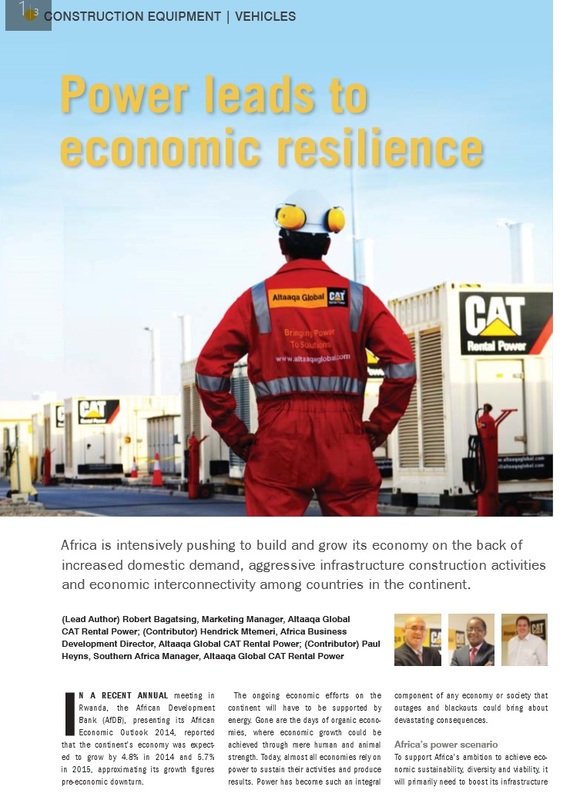 When time is of essence, rental power companies, like Altaaqa Global CAT Rental Power, are capable of providing solutions as needed, when needed. Utility companies in the region, like Eskom in South Africa, Kenya Electricity Generating Company, Tanzania Electric Supply Company, the Power Holding Company of Nigeria, the Concelho Nacional de Electricidade in Mozambique, the Empresa Nacional de Electricidade in Angola and the Société nationale d’électricité in DRC, among others, can hire temporary power plants in times when the demand outpaces the supply, when the electrical grid becomes unstable due to a spike in electricity requirement or when power distribution networks are unavailable, like in the rural areas. This will allow them to bridge the supply deficit immediately. 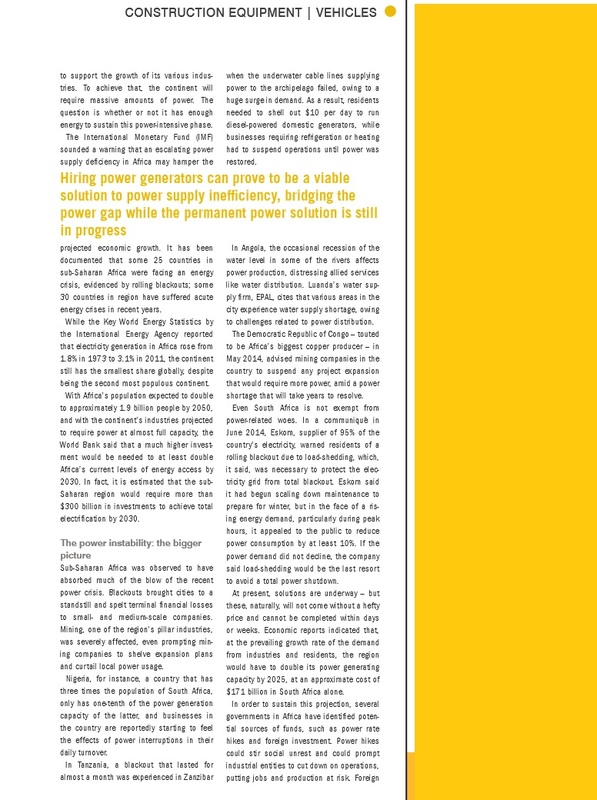 Hiring power generators can prove to be a viable solution to power supply inefficiency, bridging the power gap while the permanent power solution is still in progress. With an immediate solution on hand, the governments and the utility companies can avert resorting to raising the prices of electricity or curtailing the supply of power during peak hours. On a greater scope, an instantaneous resolution of Africa’s escalating energy supply challenges will preclude social and political instability and massive financial losses to businesses and individuals. The continent that was once regarded as a tail-ender in terms of development, is now making an aggressive move towards economic stability and viability. To sustain the economic growth that Africa is now enjoying, it is imperative that the governments in the continent address the critical issue of chronic power shortage, which could hamper the development of various industries in the countries. The effort that the African governments are putting to address this predicament is commendable, but there exist other entities that can help them to further alleviate the situation. 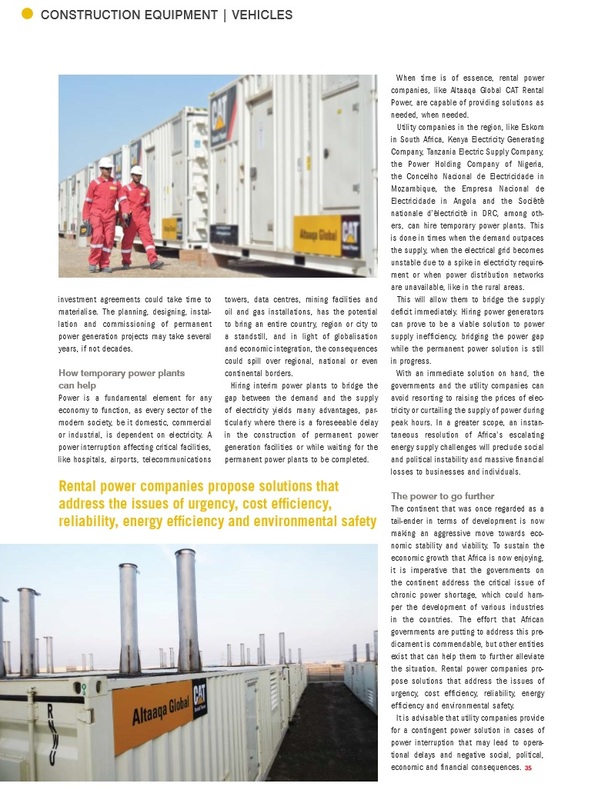 Rental power companies propose solutions that address the issues of urgency, cost-efficiency, reliability, energy-efficiency and environmental safety. It is advisable that utility companies provide for a contingent power solution in cases of power interruption that may lead to operational delays and, ultimately, negative social, political, economic and financial consequences. 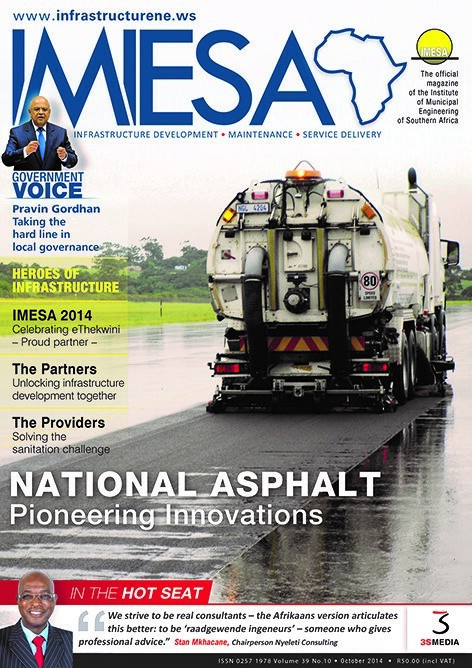 The foregoing article was originally published in the October 2014 issue of IMIESA, published by 3S Media, South Africa.